How do you like your Daredevil? Served in a beautiful hardcover, in the form of a convenient take-it-on-the-train trade paperback or as single issues to be treated carefully and then put away for posterity? For many older issues, there isn’t much of a choice, but a great many of Daredevil’s adventures have been collected. This includes all of volume two, which, for the most part, is available in more than one format. 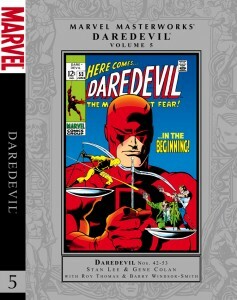 The sole exception is the Playing to the Camera arc, written by Bob Gale, which was released as Daredevil #20-25. The question of whether it ever will be collected resurfaces from time to time, but there is currently no indication of any such plans. 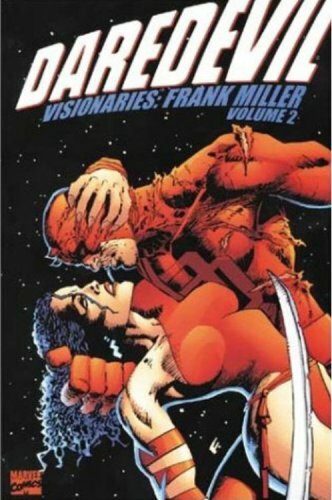 About a year ago, I wrote a post called Daredevil Volume 2 for Dummies, which contains a comprehensive list of all volume two collections. 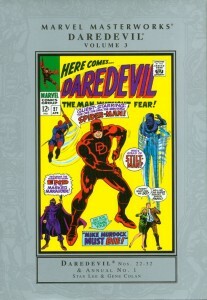 It was recently updated too, and provides a good guide to the last ten years of Daredevil publication. Collected editions from volume one don’t cover every writer and era, but there’s still quite a bit of material out there. With this post, I’m going to attempt to list all volume one collections. I can’t promise perfection, but I’ll do my very best. Let me know if there’s something missing from this list and I’ll add it. The Essential series features more issues per volume and are much more affordable. However, the art is in black and white. Volume five of this series comes out next year. 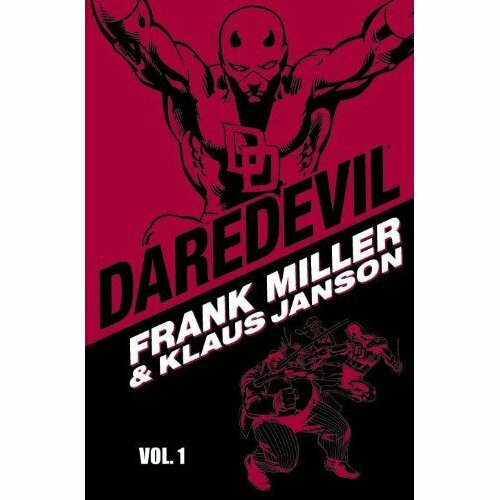 Volume 1 collects Daredevil #1-25, volume 2 collects Daredevil #26-48, volume 3 collects Daredevil #49-74, and volume 4 collects Daredevil #75-101. 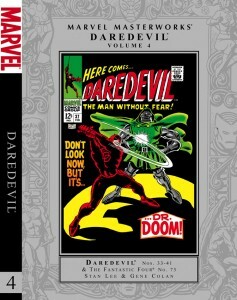 Volume 5 will be collecting Daredevil #102-125. 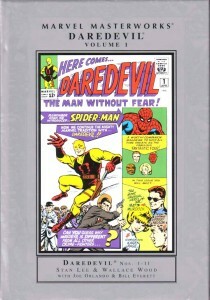 Each book also contains stray issues from other titles in which Daredevil appeared. For a full description, click any of the links above to go to the product description page on Amazon. 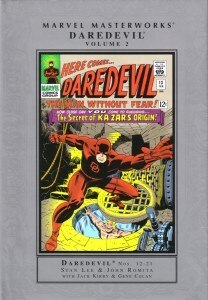 This series contains three volumes, available in both paperback and hardcover, collecting Daredevil #158-167 (though not #162), Daredevil #168-182, and Daredevil #183-191, What If? #28 & 35, and Bizarre Adventures #28Most of the issues of the first volume were written by Roger McKenzie and penciled by Miller, who took up the writing duties with #168. If you just want one (well, two) gigantic volumes and have a lot of cash, the Omnibus and the Omnibus Companion are just what you’re looking for. The Omnibus is hard to come by and starts at roughly 150 dollars, but if you’re still interested, have a look at the Omnibus at Amazon.com. Here is the Omnibus Companion. Aside from the Silver Age issues and Frank Miller’s run, there are also other select story arcs available. The TPB Daredevil: Love’s Labor Lost collects some of the stories which followed directly after the first Miller run. It’s a good volume and can be found at reasonable prices. It also features some really nice art by David Mazzucchelli. Ann Nocenti fans are getting a new collection next year. In the meantime, there’s Daredevil Legends Vol. 4: Typhoid Mary, with art by John Romita Jr. Two story arcs from D.G. Chichester run have been collected as well, in Daredevil: The Fall of the Kingpin (collecting the story arc known originally as Last Rites), and Fall From Grace. Well, guys, I hope this was enlightening, especially if you’re new to Daredevil and don’t know where to begin. And, have a Happy Halloween! Thanks for the informative post! Question, though: does the Ann Nocenti TPB coming out next year start at the beginning of her run, or is it from somewhere in the middle? Hopefully at some point they will have all of her stories collected from start to finish. Same with Chichester, especially since neither of his Daredevil collections are actually in print right now. “Daredevil: Lone Stranger TPB by Ann Nocenti and John Romita, Jr. I really like having the comics themselves as opposed to the volumes. Having said that, I’ve had to gather up trades for many of the stories as I returned to collecting the comics about four years ago after a very long lay off. It’s a bit of a regret that I gave away in the late 80s my complete collection (around 60 issues at the time) including most of Miller’s run (so, at the time, these would have fetched a penny or two) to a friend when I gave up comics at that time. But the trades are certainly nice to have and keeps the material better for longer. hey, what happened to the DD feed? As a kid , I enjoyed reading DD. Now I have just purchased Masterworks 1-8 to reread. What would be your suggestions to read next in volume or omnibus form? I liked his character , because he was a lawyer and as a hero he had the flaw of blindness. I thought that was a neat imaginative idea to consider. Hey Terry, sorry for the delay. My suggestion would be to read the Frank Miller stuff next. 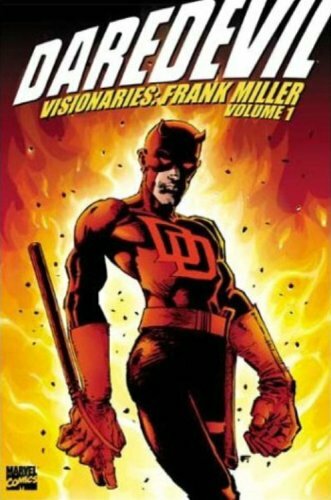 There’s a big gap between where the Masterwork collections end and Frank Miller’s stuff begins, but none of it is required reading per se. There is one collection that is not included on this list (actually there are a few of those), and that is Daredevil vs Bullseye, which collects Daredevil #131–132, 146, 169, 181, 191. Frank Miller’s run begins with Daredevil #158, so you’d be getting three pre-Miller issues in that collection, although it’s based on a particular theme (battles with Bullseye), so I’d still move on to the Frank Miller stuff if I were you.